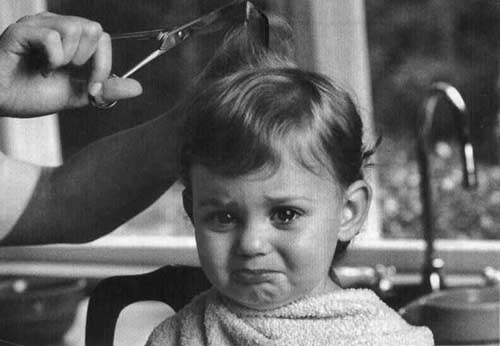 Whenever I see this picture, mixed feeling arises within and I’m reminded of my younger son, Tuktuk, who cried at the time of every haircut till the age of two and a half and no amount of cajoling could stop him from crying, even the glimpse of this child is very close to my son’s look, when he was a toddler. This picture gives me goosebumps and tears flood my eyes n blurr my vision..and I feel like taking the child in my arms close to heart…My child is now a big man who has completed silver jubilee of his age but when I meander down the lane and recall the past memories, I feel as if it is of yesterday. On Sundays, my husband planned to go for hair-cutting with his two tiny tots…They got ready fast on pretext of riding on LML vespa, the common scooter of those times..but the happiness subsided of Tuktuk as he landed at the salon for hair cut and as the barber readied him to start the cutting, he use to cry on top of the voice. This went for more than a year, the passers by hoarded at the salon to watch the child crying inconsolably. “Mummy, you don’t know, it pains a lot that’s why I cry” He explained me innocently and I was bowled over by his expressions. I cuddled him in my embrace and explained him that hair cutting is not painful n asked him not to cry next time. That day, I understood the reason n laughed at his innocence. Gradually, he came out of this habit n I could just say, Mera Masoom bachcha. All I am left with was a smile reading your post. A small instance wonderfully expressed with full of emotions of the child and the mother as well. Loved the article. This is what creative writing is!